President Trump gave his first speech to the UN General Assembly Tuesday morning, highlighting a number of issues facing the United States and the world. "We meet at a time of both immense promise and great peril," Trump said in his opening remarks, touting the status of the American economy since his election in November 2016. "As Americans, we do not seek to impose our way of life on anyone but instead let it shine as an example...The American story is the story of what is possible when people take ownership of their future." As a main theme, the President rejected globalism without rejecting working relationships with other countries. He stressed the importance of alliances in order to embolden individuals and argued the UN can accomplish important goals without sovereign states giving up inherent values. After making it clear his interest is in creating and bolstering working relationships with countries around the world while protecting the sovereignty of the United States, Trump went directly after the United Nations for focusing on bureaucracy rather than results. He also highlighted the hypocrisy of notorious human rights abusers sitting on the UN Human Rights Council. "It's an embarrassment to the UN that governments that violate human rights sit on the UN Human Rights Council," he said. 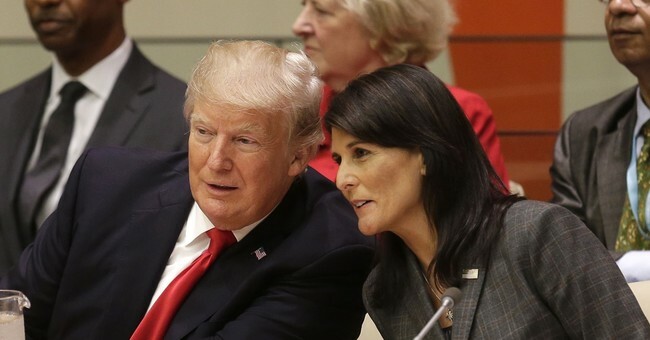 Right out of the gate, Trump called out rogue regimes sitting in the UN for their state sponsorship of terrorism and support for unrest around the world. "We must drive them out of our nations. It is time to expose and hold responsible those countries who support and finance terror groups like al Qaeda, Hezbollah, the Taliban and others that slaughter innocent people," Trump said. "The United States and our allies are working together throughout the Middle East to crush the loser terrorists and stop the re-emergence of safe havens they use to launch attacks on all of our people." Further, he argued it is in the best interest for the world to come together against dangerous state actors, saying, "The righteous many must confront the evil few." Those evil few, detailed by the President, are North Korea, Venezuela, Iran and to a lesser extent, Cuba. "Rocket man is on a suicide mission," Trump said. "No nation on earth has an interest in seeing this band of criminals arm itself with nuclear weapons and missiles. The United States has great strength and patience, but if it is forced to defend itself or its allies, we will have no choice but to totally destroy North Korea. Rocket man is on a suicide mission for himself and for his regime. The United States is ready, willing and able, but hopefully this will not be necessary." President Trump will make a decision in the coming weeks about whether to re-certify the Iranian nuclear agreement signed under President Obama. During his remarks, he seemed to give a preview of whether the deal will survive. "The Iran deal is an embarrassment to the United States," he said. "The Iranian government masks a corrupt dictatorship behind the false guise of a democracy. It has turned a wealthy country, with a rich history and culture, into an economically depleted rogue state whose chief exports are violent, bloodshed and chaos." To the surprise of many members, the President went after socialism and communism as failed systems that have lead to immense human suffering throughout the decades. "The problem in Venezuela is not that socialism has been poorly implemented, but that socialism has been faithfully implemented," he said. "Wherever true socialism or communism has been adopted it has delivered anguish, devastation and failure." "The Venezuelan people are starving and its country is collapsing," he continued. Trump encouraged all nations to put their interests first as he will continue to do as President of the United States. "We will fight together, sacrifice together and stand together for peace," he said. Secretary of State Rex Tillerson, Treasury Secretary Steve Mnuchin, UN Ambassador Nikki Haley and National Security advisor H.R. General McMaster attended the speech.